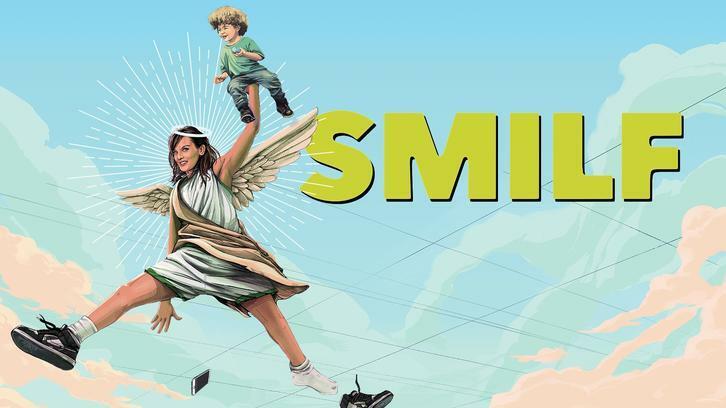 SMILF season 2 picks up right where season 1 left off, with Bridgette looking for her estranged father, giving unsollicited advice to innocent bystanders., and Tutu being, well, Tutu. The episode starts with Bridgette watching some kind of clone of herself riding a stallion, in a frilly white nightgown (Bridgette, not the stallion) looking more well-groomed than she ever had in season 1. For a minute there, I actually wondered if I'd started watching the wrong show, or if Bridgette had suddenly gotten an acting role in a medieval movie. As it turns out, it was a dream sequence, the use of which I'm still trying to figure out. Back in the real world, Bridgette is actually in Philadelphia, this time wearing some colorful sweats, and looking for said-father. As luck would have it, it appears he's back in Boston, from which Bridgette just came. Not one to leave empty-handed, she does get a massage from the woman who now lives in Richard's place, and his Boston address. For someone who struggles with money so much, I have to wonder where she found the funds to even come to Philadelphia (hopefully not the way she pays rent sometimes) and especially why she didn't call to see if her father still lived there. I personally avoid calling people I'm not 100% sure I won't be bothering (i.e. my mom and, uh... that's it), so I get it, but it would have saved her the trip. Not to mention it's probably less traumatizing to talk to your estranged father on the phone rather than just show up on his doorstep. I wouldn't know though, I would probably have emailed him. The woman also informs Bridgette the dark horse in her dream is a representation of her shadow self (sure, why not). Keeping with this 'surely there's a better way' theme: while Bridgette is waiting for her flight back, she starts telling off a complete stranger about how he's disciplining his kid. Now, I would never give anyone advice about how they raise their children since 1. I'm of the "mind your own business" team unless there is genuine concern for the kid's well-being 2. I can barely take care of myself. But Bridgette councelling anyone feels especially inappropriate. She clearly loves her own child more than anything in the world, and does her best wiht what she has, but let's not forget the time she hooked up with a mere acquaintance she hadn't seen in years while baby Larry was sleeping in that same bed. Bridgette's bad luck continues however, since as she heads out of the airport, she realizes she's missing her wallet. After almost getting gunned down by security as she tries to get back on the plane (calm down America! ), she meets Mr Not A Good Dad again at the lost baggage claim. (Don't find your bag on the conveyor belt? Go there. Lose your wallet on the plane? Go there. I was half expecting to see Tutu shopping around for food there too at this point.) Bridgette and the guy's little kid bond in a sweet moment that makes her miss Larry, and as her wallet is MIA anyway, she leaves the airport and calls him from the cab (again, where does the money come from?!). During this time, Tutu (who wasn't shopping at the airport, clearly), heads to the store for some batteries. At first, she tries to bring an unwilling Larry but quickly gives up and leaves him with live-in boyfriend Joe. A questionable decision at the best of times, but now especially since Joe seems in worse shape than ever and promptly downs a bunch of pills. Sure enough, Joe soon plunges headfirst into his bowl of soup, leaving a blissfully unaware Larry to watch TV. At this point, I was (naively) hoping he was merely unconscious, which would already have been pretty upsetting. However, Bridgette comes home to a now clearly deceased Joe, with Larry sitting close by. One wonders if Joe actually died from the pills or if he drowned in the soup. But seriously, how much trauma can this child endure?! Bridgette confronts Tutu about leaving her child quasi-alone, but Tutu isn't here for her parenting advice (understandable). Instead of pretending to be a "roaming child psychologist" Bridgette should maybe consider the title of "unsollicited advice giver". The funeral brings together their loved ones: Eliza (whom I'd given up hope on seeing in this episode) and Bridgette's sometime boss, sometime face-peeled, yoga-avoiding, junk-food-secret-eating friend, always mess: Ally. Ally was rambling about prostitutes, Eliza was high as hell, Bridgette was wearing a nice but inappropriate dress, all staples of what you'd expect a funeral to be like on SMILF. Likewise, this wouldn't be SMILF if some kind of unnerving situation didn't happen, so Bridgette suddenly has to pee and desperately tries to find a bathroom, only to end up in her ex-teacher's sink (don't ask). The teacher, clearly a hoarder not only of material posessions (the toilet had all but disappeared under piles of junk) but of information, is the one who reveals to Bridgette that her father is dead, and has the newspaper clipping to prove it. And just like that, Bridgette loses a step father and a biological father almost simultaneously. As a teary Bridgette steps up to eulogize Joe, she ends up sharing quite a sweet moment with Tutu. Tutu had seemed a little detached about the whole thing until then (not judging, everyone grieves in their own way) but breaks down in the church as Bridgette speaks. For a so-called comedy, SMILF's often bleak outlook makes it quite a dark show. That's all for this week! Did you guys expect Bridgette to find her father? Would you pee in a sink if you had no other options? And what was the meaning of all the horses in this episode?! Here's to hoping the upcoming season brings Bridgette some stability (hope springs eternal), and us more scenes with Eliza and/or Ally! SMILF airs every Sunday at 10:30pm ET on Showtime.